Where the asterisk means that this option had won. This command should create a table where one column is the part before the : and the other is the part after the colon. 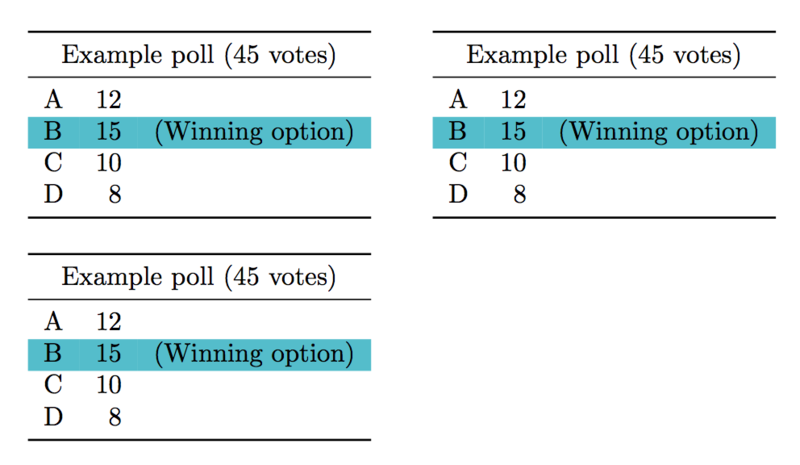 If a colon ends with an asterisk, this line will be highlighted (with a background color) and the text "Winning Option" should be appended to the line. I also want to sum up all votes and print an error if the sum of the votes is unequal the sumofvotes parameter - if such a parameter is present. It can be cleaned up. I just wanted to show the basic approach one might take. One key here is that the \foreachitem loop variables of the list must be expanded as it is being stuffed into the tabular array. For this, I found it easier to use a token list. You will see I did nothing with optional variable #1, but you could end the macro with and \ifnum test comparing #1 and \votetally, and burp an error message if they fail to agree. Using endlines as delimiters is quite a problem with TeX, so I suggest the standard line terminator \\. Not the answer you're looking for? Browse other questions tagged tables macros or ask your own question.